Avoid rising energy prices. 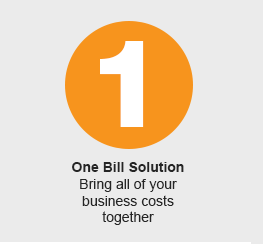 FIX your Gas & Electricity costs with Unicom today. No price increases for 3 years! * What have you got to lose? 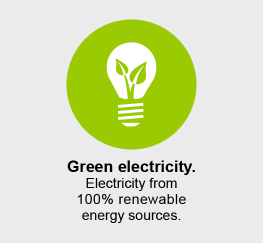 Our electricity is 100% green – straight from renewable sources to your business. Click here to read more about Green Energy. Don’t worry. You can still FIX your energy costs at today’s prices. All you have to do is click the LOA button opposite, complete and sign the form and then we will be able to contact your supplier directly and make the arrangements for when your contract expires. 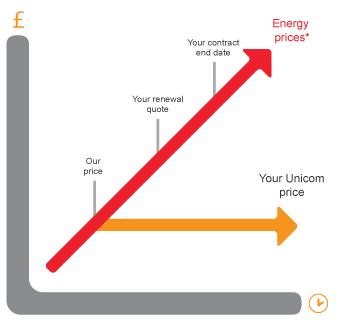 Energy prices fluctuate fairly frequently, however, if you look at the trends over an extended period, it doesn’t make great reading for businesses. 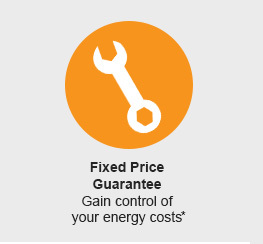 Fixing your energy prices for a period as long as 3 years could be hugely beneficial and lead to significant savings. 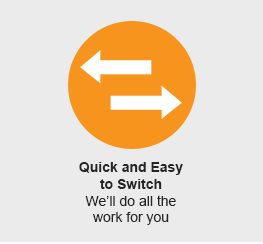 Don’t worry if you’re in a contract with another supplier, we can still fix your prices at today’s rates ahead of a switch when your contract ends. If you’d like to find out where our electricity supply comes from take a look at our fuel mix document by clicking here. You’ll see that there is a 21% increase in the total amount of renewable electricity sourced from renewable fuels and supplied by Unicom compared to the national average! As these are reported a year in arrears, our next year’s fuel mix disclosure will show an increase of renewable sources of 70% as we transition to green electricity. * The fixed prices may be varied as per your Terms and Conditions, a copy of which is available at www.switchingon.com/terms-and-pricing.